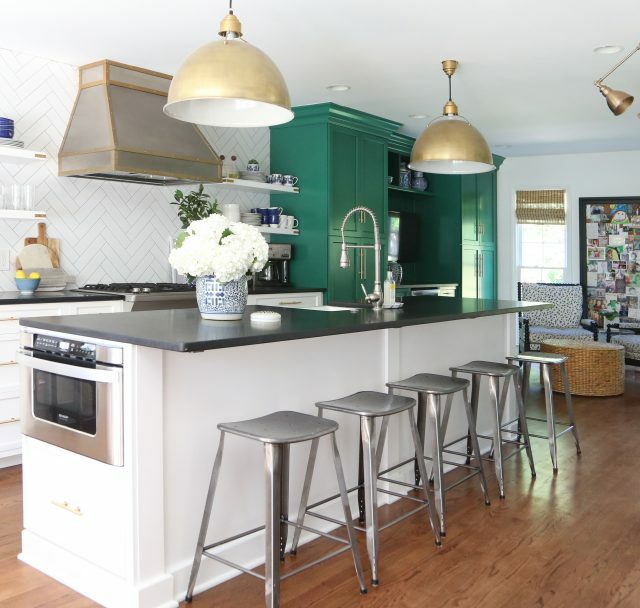 When planning our recent kitchen renovation, I knew I wanted to go in a different direction from the granite countertops we had in our last house. I was forever wiping them down, only to see more streaks. I also wanted something that was low maintenance and to stay away from anything that felt really trendy. (This renovation is for the long haul.) I know you’re thinking I studied different materials for hours and looked at a billion samples. In reality, our kitchen designer brought over the honed black granite sample from her own kitchen, said it was easy to maintain and I committed. I do occasionally notice that there will be some ring marks left that you can see in the right lighting. (Look closely at the photo above, and you can see one.) I put a call out on this Instagram post and got a lot of good cleaning suggestions, in case you’re looking for some as well. By the way, some of the rings that were bothering me before are barely noticeable now. . . Anybody else have experience with honed granite? What are your thoughts? See the full kitchen reveal post (with sources) here. Do you subscribe to my Friday Find email? I have a great “look for less” deal going out tomorrow! Sign up here. I love your kitchen so much Emily. I cannot wait to see your bathrooms. that counter top is gorgeous. We have had the honed black granite for 8 years now. I still love it. I think the rings and minor imperfections only give it more character. I don’t use any special cleaner because I haven’t found one that works better than a regular dish cloth! I put honed granite countertops in my last house! I was trying to mimic the look of soapstone and just do something that was a bit different and not trendy. I loved the way they looked but my husband despised them. He thought they stained easily and were streaky and impossible to make look clean. But our granite installer told us to use Windex, so maybe that was the problem. Anyway, my husband hated them so much I don’t think I can get him on board to put them in any future homes! We bought a new house that has black polished granite. It wouldn’t have been my first choice, but it does look pretty and cleaner in my opinion. I love how the honed granite looks in your kitchen! I have regular (shiny look finish) black granite and I love the look, but have had a problem with streaks. I use the Puracy multifinish cleaner, then wipe up with a paper towel, which eliminates streaks. They were here when we moved in and that was one of the things I loved about the kitchen until I realized they were a nightmare with streaking. I’m glad to know that the honed granite takes care of that problem, because I really love the contrast of my light gray cabinets and the black countertops. Thanks for sharing this, just in case we end up building I needed an option. I have had black honed granite for about 12 years now and love them. Yours look fantastic! Did you have a sealer put on by the installer? If so, what kind/brand? They did seal it but I had nothing to do with the process. Not sure of name/brand…. We used black honed granite on our perimeter countertops. I would also give it two thumbs up. Like you, I like the fact that spills are a non issue and it’s easy to clean and maintain. I would definitely recommend it! Love the finishes you’ve chosen! How do you like your microwave drawer? We are considering this for our kitchen remodel. LOVE it! I wasn’t sure about it but it has ended up working out well for us and I love that it’s tucked away. I am curious to know your source for the honed granite. Thank you for this post. I have always wanted honed black granite coutertops and will be starting a kitchen renovation soon. I had been reading a lot of negative things lately about the honed finish so was wavering on my choice. But now I feel more confident! 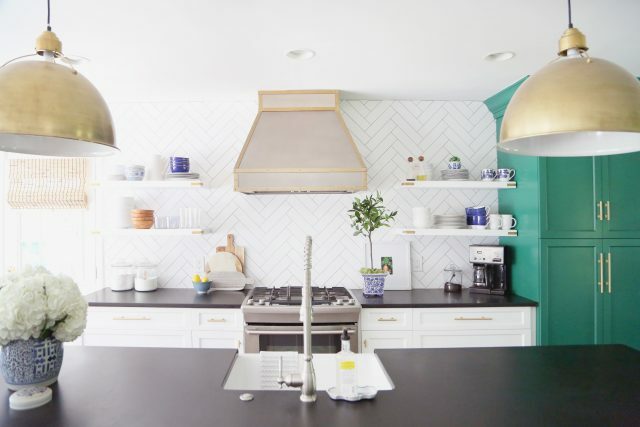 Your kitchen is gorgeous, Emily! 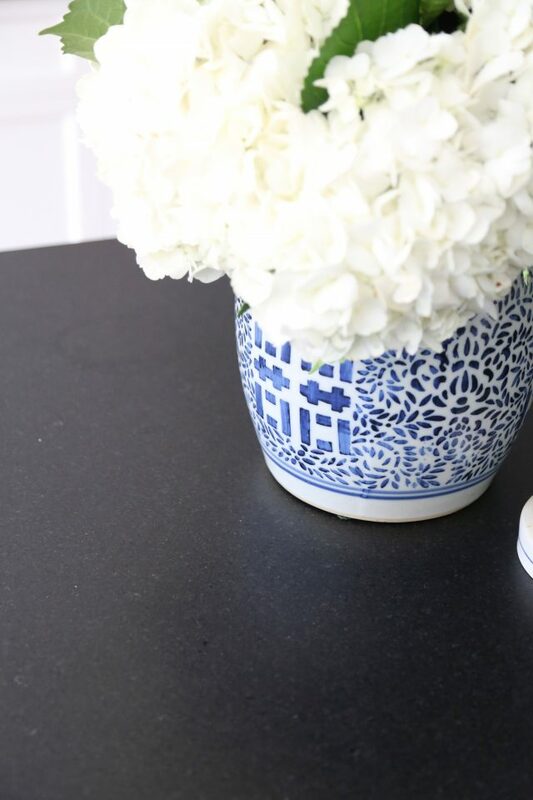 I love the look of your countertops too! We have polished granite and the only thing I’ve found that leaves my counter streak-free are my Norwex dishcloths or envirocloths. Regular dishcloths constantly left streaks and it drove me batty! I just replaced my shiny black granite with white quartz. My kitchen is very dark, no windows. The white quartz made a big difference in the brightness of the room. But I do think black counters are timeless. Your kitchen is beautiful! I love your counters so much! Beautiful! I work for a kitchen/bath dealer and countertop fabricator in OKC. Most of my countertops are polished quartz (Cambria, Viatera and Silestone), but my island is a gorgeous leathered absolute black. I love it, and it’s so easy to care for. I also have the leathered absolute black. Do you have a problem with stains and spots on it? Mine is the honed Absolute black. Is yours sealed and if so with what? I looked at honed black granite for my kitchen renovation 2 years ago, but ended up going with soapstone. I really wanted a carefree countertop, & once you get a pantina going with soapstone (it takes about a month), then you only need to wax it once a year. What I really wanted was a huge, double soapstone sink, & I got it. 39”x18”x 16”deep. The stonemason said it was the largest he had ever built. Perfect size for my big stockpots! My colors are white, black & grey, so that I can change up my accessories with the season. I went with a superslab of Cambria (Torquay) for my island. Our house is circa 1748, so I wanted a kitchen that blended traditional & classic New England style. I LOVE my soapstone, too! We put it in in May and I still walk on every day and think it’s beautiful (even covered in crumbs, art projects, and bills)! We haven’t had any maintenance issues and we leave glasses on it overnight, I set spaghetti sauce spoons on it, etc. I was going for a similar look as you but we did butcher block on the island. Soapstone lovers unite!!!! I have a large black soapstone island and a large custom double basin apron front soapstone sink! I love it! Super low maintenance. Just waxing a few times initially, it is funny when I hear people say they are high maintenance. We have 8 kids and it’s a great countertop and gives us the timeless vintage look we were after. I also love my Soapstone countertops! I definitely don’t baby them and have found them to be very hardworking. I’m not a perfectionist so I don’t mind the occasional rings and water spots around the sink area, especiallly because I know they’ll disappear with just a little mineral oil. 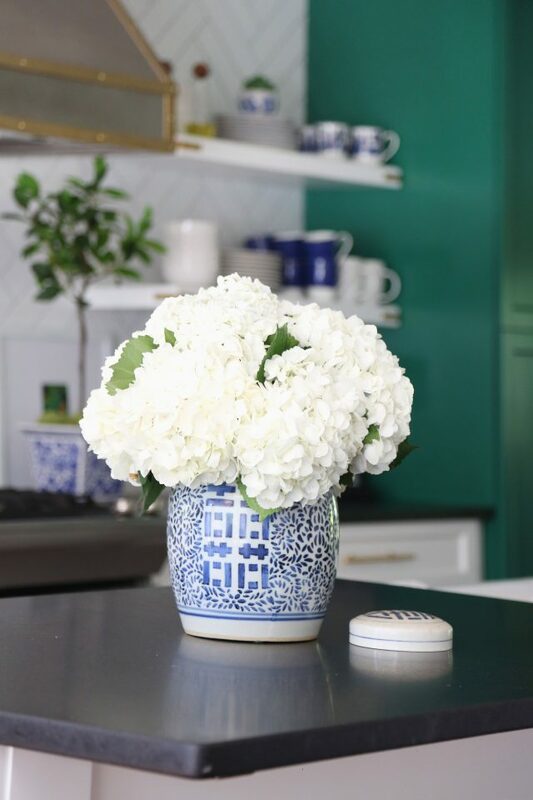 It’s a timeless look with my white shaker cabinets and the white veining makes them unique and stunning! I’m studying your kitchen posts like they’re an entrance exam for law school. Now that the dining room wall is down and the beam and support columns are in place we are getting ready to take every single thing out of the kitchen (fortunately found someone to do that!) and start fresh. First thing to go in will be the floor. I’ve loved reading your blog and seeing all your projects for so long and enjoying all of your efforts. You have such an eye for elegance and at the same time making a home comfy and welcoming. I can’t believe how fast your children are growing up–LOVE seeing pictures of them on your blog and on IG. Hope all is well. Sending hugs! Hey Emily! 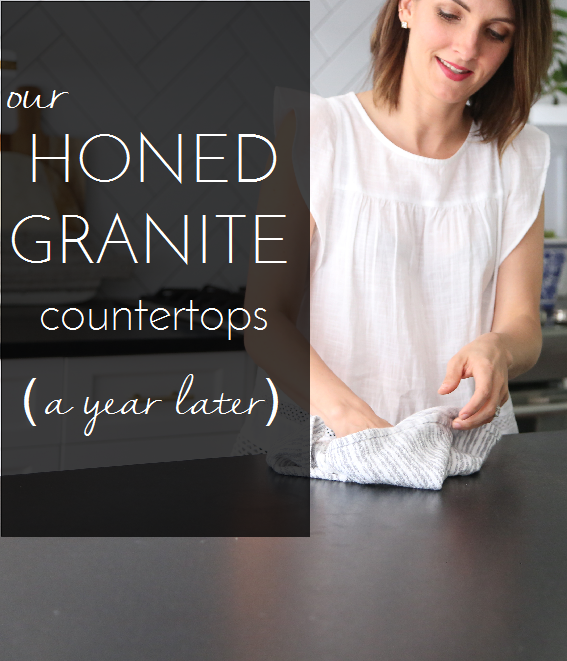 We actually have honed granite in our kitchen and it drives me a little crazy. For us, it does leave spots and stains and the only way to get it off is using a microfiber cloth and cleaner – which is fine but sometimes I’m rushing and just want a quick wipe down with a paper towel – but that will leave streaks. Ugh. I will try this method cleaner though! Oops, guess I’d better stop using Windex on mine! After several years of having polished black, I decided that honed would look better and be lower maintenance. After several phone calls, I found someone who would come to the house and hone them. I’m so glad we did it! With 3 boys, it’s so much easier to keep clean, and it adds a softer look to our kitchen. I make my own windex (sort of) I use equal parts of alcohol and water with a drop of dawn. I use it on the stove,sink and counters. Your kitchen is amazing! Did you have the cabinets made custom or are they ready made? I looked everywhere for the source but didn’t see one. Thanks for the tip on the “Windex”. Our cabinets are custom. I noticed that your corners are pretty rounded. I just got beautiful quartz countertops last year, but I let the guy at the place talk me into rounded corners. then I noticed that the counters I liked on Pinterest had more squared off corners and I feel sad that I didn’t insist on that. Did you choose to round them more for safety of looks? How thick is the honed granite? Thanks! We chose honed absolute black granite for our new home too… kitchen AND master bath … it’s been three months now and I LOVE them! So easy to care for! I was scared because our tile installers had totally destroyed the counters and stainless cooktop while installing our backsplash BUT our builder had the counters buffed to fix it (and replaced our cooktop) and they are perfect:)). Your kitchen is beautiful!!! Thank you for sharing! Hi Emily. Did you try using a poultice on those rings? It’s a pretty common problem and a simple poultice of talcum powder and hydrogen peroxide will draw out most stains. 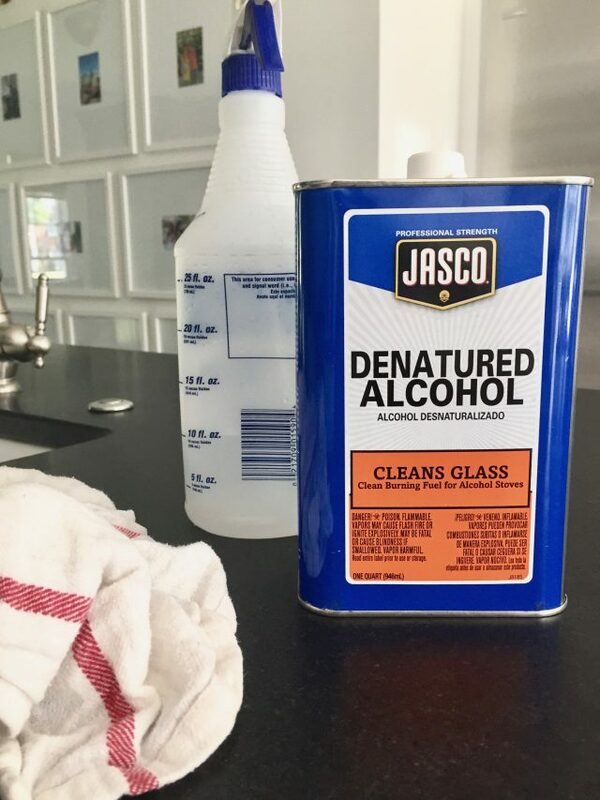 Swapping out the peroxide for acetone also works really well. The trick is to leave the poultice on there for 24 hours without letting it dry out. Covering it with plastic wrap and taping down the edges with blue painters tape is how I do it. If it’s an oil stain you’ll probably need to buy a premade poultice that’s made specifically for oil. Stains like this can be a bit of trial and error but 90% of them come out with the solutions I already mentioned. Ugg, I have honed leathered Absolute Black granite kitchen counters. We’ve had them just 2 months. A guest poured a glass of champagne and it bubbled over, but didn’t bother to clean it up. I didn’t notice until the next morning. Now I have two big rings spots, one from the bottle and one from the glass. I used baking soda and hydrogen peroxide and let it set for 24 hours, covered in plastic wrap. I’ve done it twice now and the rings aren’t coming out. I’m so upset. I read about using oxy clean and was going to try it – any thoughts ideas etc would be helpful. My installer did not seal it.